Bend Fire crews responded to a reported kitchen fire in the Greenwood Manor retirement apartments, at about 10:30 this morning. Upon arrival, they reported seeing light smoke coming from a second floor exterior door. The initial crew made entry with a 5 gallon pressurized water extinguisher, called a water can, and were successful in locating and entering the apartment, extinguishing the fire and completing a search of the apartment. All occupants of the second floor were moved by staff to the first floor, as the fire department crews completed mop up and overhaul operations. The cause was found to be a cooking fire on the range top. Damage was limited to the stove and the wall behind it, as crews opened the wall to ensure there was no hidden fire. 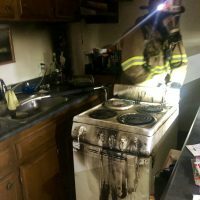 The Bend Fire Department reminds you that kitchen fires are a major percentage of all structure fires, and leaving a working stove top unattended for even a short time can have devastating consequences. • Always keep a lid nearby when you are cooking. If a small grease fire starts in a pan, smother the flames by carefully sliding the lid over the pan. Turn off the burner. Do not move the pan. To keep the fire from restarting, leave the lid on until the pan is completely cool. • Never pour water on a cooking pan grease fire. • Baking soda can work to extinguish grease fires if sprinkled on top of the fire. • In case of an oven fire, turn off the heat and keep the door closed until it is cool. After a fire, the oven should be checked and/or serviced before being used again. • When in doubt, just get out! When you leave, close the door behind you to help contain the fire. After you leave, call 9-1-1 or the fire department from a cell phone or a neighbor’s telephone. • Never pour water on a cooking pan grease fire. • Baking soda can work to extinguish grease fires if sprinkled on top of the fire. • In case of an oven fire, turn off the heat and keep the door closed until it is cool. After a fire, the oven should be checked and/or serviced before being used again. • When in doubt, just get out! When you leave, close the door behind you to help contain the fire. After you leave, call 9-1-1 or the fire department from a cell phone or a neighbor’s telephone. • If you know how to use a portable fire extinguisher and are capable of fighting the fire, be sure others are already getting out and that you have a clear path to the way out. Call 9-1-1 or the fire department from outside the home. Remember: Never Move a Burning Pan on an Stove Top! Bend Fire is always available to come and make sure the kitchen is safe.